WHAT IS A HERCULES BEETLE? Like all beetles, Hercules Beetles have chewing mouthparts and hardened front wings (elytra). Hercules beetles are in the scarab beetle family (Scarabaeidae), which also includes Japanese Beetles, June Beetles, and Dung Beetles. 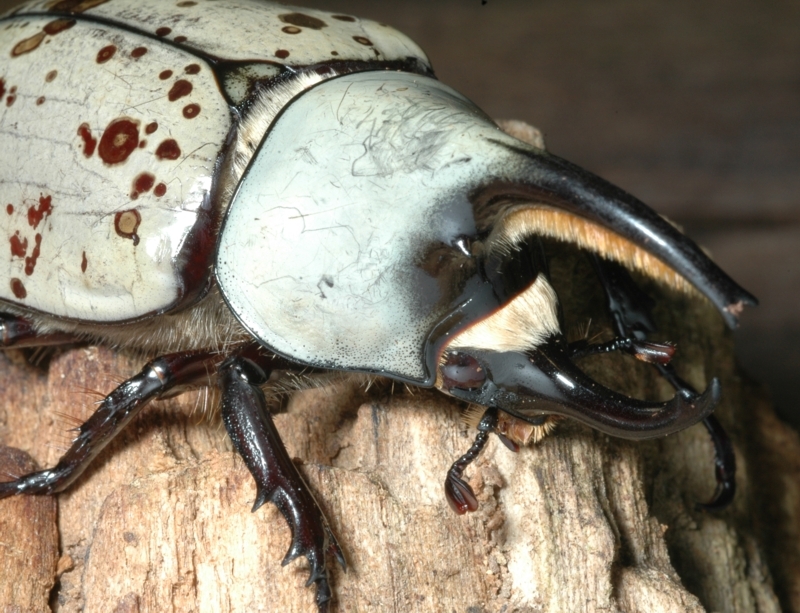 The only Hercules beetle species in Kentucky is the Eastern Hercules Beetle, Dynastes tityus, which is the largest beetle in this part of the country. Adult Eastern Hercules Beetles typically have green, gray, or tan elytra mottled with black spots (rare individuals lack spots). Click here for a picture showing color variation among adult Hercules beetles. 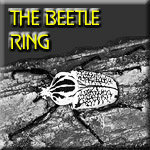 Adult male beetles have 2 large horns: 1 on the head and 1 on the thorax. They also have 2 small horns located next to the large thorax horn. Females lack horns. 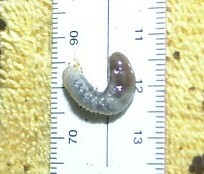 The large larvae, called "grubs", have c-shaped white bodies and (like all beetle larvae) chewing mouthparts. Eastern Hercules Beetles have "complete" metamorphosis with egg, larval, pupal, and adult stages. Female beetles lay eggs directly into the soil during warm months. Click here to see a picture of a Hercules beetle egg. In about 1 month, the eggs hatch into larvae. During the next 6 months to 1 year, the larvae live underground where they grow and molt (shed their skins) twice before turning into pupae. As with all insects, each immature stage is called an "instar." 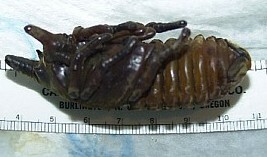 3rd instar Hercules beetle larva - up to 4 1/2" long. The adults emerge from pupae after only a few weeks, but will remain underground until spring. Upon emerging from the ground, females will begin emitting pheromones to attract male beetles. After mating, females burrow into the ground to lay eggs. You can see a video (a .wmv file, which can be viewed with compatible players, such as Windows Media Player) of Hercules beetles mating at Bill Wallin's homepage. 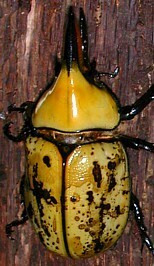 Pictured above is a "teneral" female Hercules beetle. "Teneral" refers to the soft-bodied state of an insect just after molting (shedding its skin). Typically, the teneral state lasts for a few hours while the cuticle hardens. Insects usually have pale or muted colors while they are teneral. See more pictures of teneral Hercules beetles here. Male beetles often use their horns to fight one another for the right to mate with a female. Click here to see a close-up of the damage done to one male Hercules beetle by another. You can also see a movie of male Hercules beetles fighting at Bill Wallin's homepage. Like the mating video mentioned above, it is a .wmv movie file. 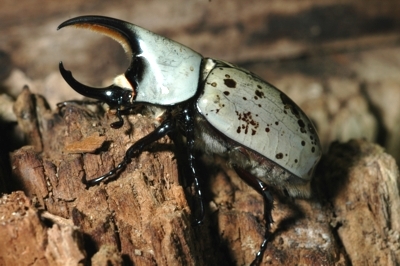 Hercules beetle grubs feed on decaying plant material, especially logs, stumps, dead leaves, and rotten fruit. Most commonly, they are found in tree stumps that they have tunneled into from the soil beneath. The grubs are a food source for skunks, raccoons, and other mammals, as well as predatory soil-dwelling arthropods like centipedes, ground beetles, and spiders. The feeding habits of the adult beetles are not well-known, but they have been observed to eat rotten fruit and the bark of ash trees. 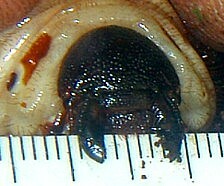 There is a mite predator that feeds on Hercules beetle eggs. It lives in the soil and is small, white, round, and the same size as a Hercules beetle egg. Click here for pictures of this mite. Another grub predator is the Mydas fly maggot, which burrows through soil and feeds on Hercules beetle grubs. Click here for a picture of a Mydas fly maggot. 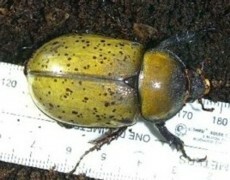 Hercules beetles are not pests in Kentucky. The Eastern Hercules Beetle is one of the most sought-after insects in Kentucky, and makes an impressive mounted specimen or photo subject. The best way to find adult Eastern Hercules Beetles is by using ultraviolet (UV) lights: like many insects, Hercules beetles are attracted to UV lights at night. In Kentucky, collectors have the best luck with this technique (called "blacklighting") when they bring a portable UV light into a clearing adjacent to a wooded area in a remote location (far from city lights). A white sheet can be placed next to the UV light for added illumination. Adult Hercules beetles are active throughout the warm months, but are most likely to come to UV lights on moonless nights with high humidity. After mounting a Hercules beetle, it is often a good idea to dip the beetle in alcohol. This helps preserve the natural color of the beetle. 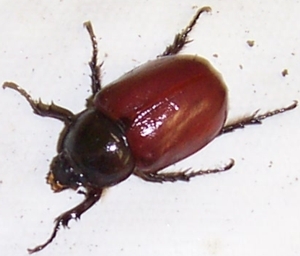 Pinned adults can turn a dark mahogany color that can be changed back to the natural color by dipping the beetles in alcohol or acetone to remove the wax layer on the adults. This allows the exoskeleton to dry. Click here to see a photo of this phenomenon. The huge grubs of the Eastern Hercules Beetle also make fascinating additions to entomology specimen or photo collections. They are most often collected deep inside rotten tree stumps, but they can also be found in piles of old firewood, fallen trees, and similar sources of decaying wood. As with all insect larvae, Hercules beetle grubs should be preserved in alcohol. The rearing of Hercules beetles has become a very popular hobby. Raising Hercules beetles is challenging, but also very rewarding. Visit our special Hercules Beetle Rearing Page to take advantage of over three years of Hercules beetle rearing experience. The horn size of an adult male Eastern Hercules Beetle is related to how much nutrition the grub received while it was growing. When a Hercules beetle is found in the soil or in rotten wood, it often appears to have a very dark-colored, almost black shell - so dark that the spots are not visible. This is because the beetle shell absorbs moisture. As the beetle dries, the dark color fades. Mating among Eastern Hercules Beetles can last for up to 50 minutes. 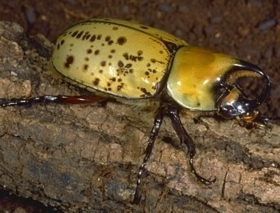 The Western Hercules Beetle (Dynastes granti), shown below, is the west coast relative of the Eastern Hercules Beetle. The Eastern and Western Hercules beetles are very similar, but male Western Hercules beetles have longer horns. Some scientists believe that the Eastern and Western Hercules Beetles are actually the same species, but with minor geographical differences. 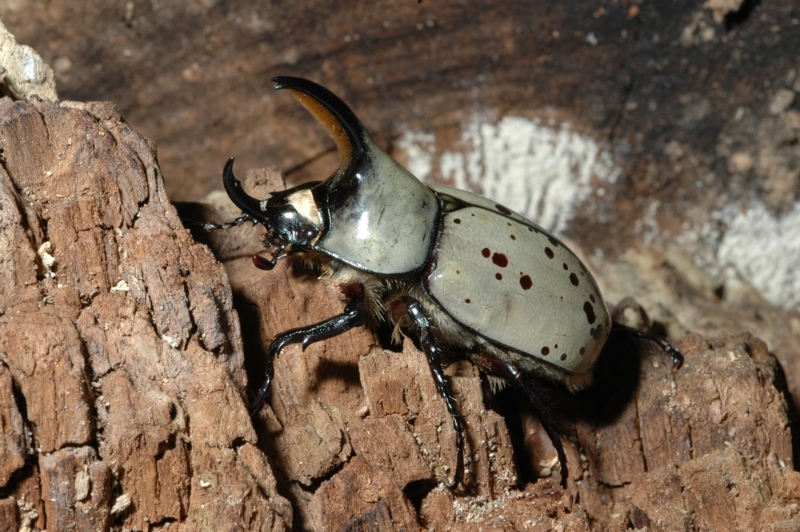 The Ox Beetle (Strategus aloeus) belongs to the same subfamily (Dynastinae) as the Eastern Hercules Beetle. It is found all over the southern united states, but is not common in Kentucky. Adults are very strong flyers and are "photophilic" (attracted to lights). They can be reared in the same way as the Eastern Hercules Beetle, except that the larvae are cannibalistic and must be housed singly. 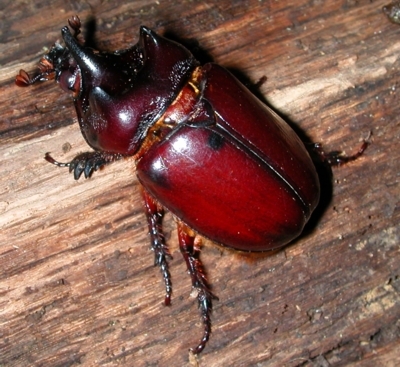 A male ox beetle is shown below. 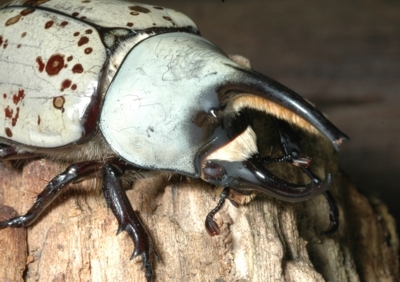 In 2002, Bill Wallin captured larvae of the Western Hercules beetle. When these emerged as adults, Wallin mated the Western males with Eastern Hercules Beetle females. The hybrid progeny emerged as adults in Fall/Winter 2007. Read more and see pictures of the hybirds here. 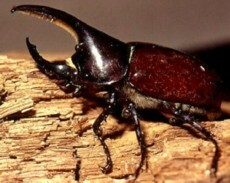 Because of their large size and impressive horns, many people believe that Hercules beetles are dangerous. In fact, their horns are not dangerous at all, and the beetles are not known to bite. However, if you pick one up, it may scratch you with its strong, spiny legs.